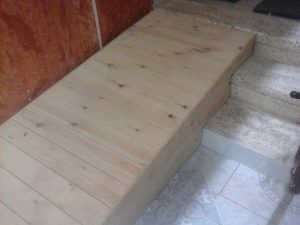 We are an Anglo/Egyptian couple who established Flats In Luxor in 2003. Jane has now retired. A keen Egyptologist she welcomes the chance to give advice about places to visit and their historical background. 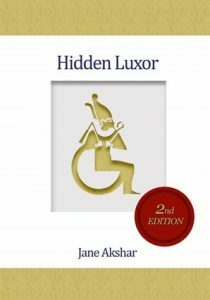 She has written a highly popular guide book about Luxor, Hidden Luxor, detailing the place tourists often miss. Mahmoud is the Egyptian half. A Luxor local, he has been guiding tourists and organising tours for many years. If he can’t fix it then he knows a man who can. 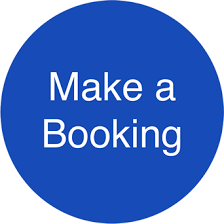 We understand that your holiday is your chance to relax so we will do all we can to make sure everything is hassle free. Anything we can do to help you make the most of the experience let us know. We hope you really enjoy yourself and become a regular visitor. Due to Jane’s increasing lack of mobility she has been looking into access at both at the historic sites and the apartments. She has run a successful campaign to get access at the temples which was inaugurated by Dr. Khaled Anany the Egyptian Minister of Antiquities and Moustafa Wasery Secretary General of the Supreme Council of Antiquities. With several ground floor apartments we have been able to provide ramps for access, wet rooms and even our swimming pool at Goubli has an easy access. 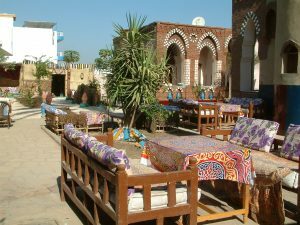 The al fresco restaurant in the Nubian Village Hotel is all ground level. 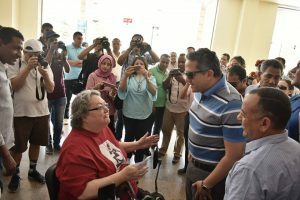 Jane and Mahmoud would encourage every visitor to Egypt to make their own arrangements with the local guides rather than use the big tour companies. If you use the tour companies none of your money goes to the local economy. You get a much better price by going local as well. 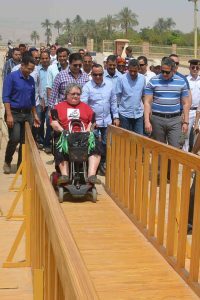 The locals have had a double whammy of increased safety concerns and the new bridge across the Nile. This means fewer tourists and those that come are cocooned in tour buses and taken from hotel to site with no local contact. Another advantage is that you can schedule your tour to avoid the hottest part of the day. Especially during the summer, wise tourists start their sightseeing really early e.g. 5 am and rest in the hottest part of the day. You also get the chance of getting to know the local people and being invited to share their lives. Egyptians are a very friendly people. By being a good tourist (using a local guide and tipping well) you will end up having meals in local homes, meeting the women and children, being invited to weddings and parties and even sitting up late drinking beer and chatting.